T-Mobile is expanding its device insurance program today with a new Plus tier. Premium Device Protection (PDP) Plus is launching this Sunday, May 7. The service offers all of the features of Premium Device Protection, including protection against loss, theft, and accidental damage, hardware service, remote wipe, and AppleCare, but with a few new features added on top. The first new feature of PDP Plus is McAfee ID Protection. This’ll get you identity theft protection tools like 24/7 access to agents for Lost Wallet and ID Restoration services. These are backed by $1 million insurance for qualifying recovery expenses, too. Also included is McAfee Device Protection, which helps to defend against viruses and other online threats, a password manager, and anti-theft features like the ability to take a photo and get the location of a person that has unsuccessfully tried to unlock your phone. This device protection covers up to 10 devices, including phones, tablets, and computers. Finally, there’s Tech Personal Help Desk (PHD). This service will give you “VIP-level access” to technical support for products that connect to your T-Mobile devices. That includes printers, TVs, and game consoles. Also announced today is JUMP! Plus, which is the JUMP! program with the addition of the PDP Plus services described above. PDP Plus and JUMP! Plus are launching on May 7, but if you’ve bought a new device and added protection within the last 60 days, you can enroll in JUMP! Plus if you’d like. Pricing for both PDP Plus and JUMP! Plus is set at $12 or $15 per month, depending on your device. With the regular Device Protection and Premium Device Protection programs, the focus is on protecting your smartphone and the info on it. Premium Device Protection Plus aims to take that a step further, giving you protection and support for your other devices as well as your identity. Not everyone will feel the need for these added services, but if you don’t already have protection for your ID and other devices, then T-Mo now has an all-in-one program for you. 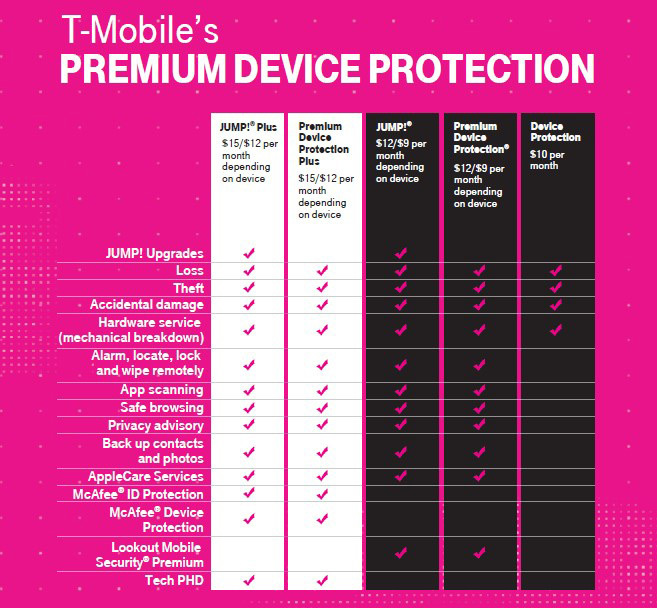 Are you enrolled in any of T-Mo’s device protection programs? Are you interested in PDP Plus? I really hope they step it up for next uncarrier move. Awwww…that’s so noiiice!. No thank you, I’ll stick with my $7 program. Would I still have to pay the $175 deductible? If so then I’ll take a pass. Like most insurance, yes there is a deductible. To me the insurance is a complete waste of money I dropped a 6 Edge + 2nd day I had it, and the digitizer went out (the glass was fine, not a scratch on the entire phone). Cost me the $175 deductible, $19.99 in shipping for a refurbished phone that did not work (plus the back was scratched), another $19.99 in shipping for another phone– which again was refurbished, and when you attempted to charge the phone the battery and the phone would not charge– and got extremely hot. I went nearly a week without a phone. The Tmobile store near me bent over backwards to get me an exchange/new phone and I returned my original, plus the 2 defective USED phones. I am not an otterbox fanboy, and screw the insurance. $15/mo is hefty. The only difference here is Loss/Theft coverage over Squaretrade or Samsung’s own insurance with a much much lower deductible. Unless you really need those “extras” (I call it garbage) I don’t see why would anyone who has a little bit of knowledge about mobile phones would need this. They will, however, will easily be able to push this insurance to the technologically challenged customers which is like 90% of the customer base. I paid for insurance for about 3 years with never a claim…. first claim I was told a payment of $175 required….. plus shipping. This is 25% of the phones cost new. Maybe they should fix that “bug” first. I’ll never get suckered into their insurance again. Just save your money you would pay and get a refurbished phone. Lots cheaper…. Phone Insurance companies should waive or lower the deductible if you had the insurance for at least 2 years. Unless your Financing or Leasing a phone insurance is useless. If the deductible’s high enough, it may just be better to just keep buying new Blu or Moto G phones instead of getting insurance though. I’ve seen my family pay enough $150 + deductibles after paying $10 or more month for insurance to realize that it’s actually cheaper to get a cheap “good enough” phone without insurance. Insurance is for a wealthy klutz who MUST have the latest technology. The fact that I can go online and pickup flagships around a year old for far less than $300 or brand new mid-rangers around $250 renders insurance with its high deductibles useless. Couldn’t agree with you more. Most mid-range phones ($399-$499) have near flagship specs and some (ZTE Axon 7 and. Axon 7 mini) come with 2 years of insurance/accident protection included. I’ll stick with my original Jump! plan, two upgrades a years instead of one. I will stick with my original jump also. I am waiting for a better deal on the S8+. Not going to pay 130 for the down payment. Another way to fleece the people. Have none of those and don’t plan on getting it. I haven’t carried insurance on my phones for years. Then, they shouldn’t be buying a phone they can’t afford. That’s not the way to look at it. The lease charges not a penny extra PLUS allows 3x yearly trade in to the latest n greatest. This benefits poor n rich alike. If you’re rich, why pay all the money up front-invest it and compound it. AND the way technology rapidly advances PLUS the asian-err shoddy way most products are made anyway – – two years later who wants to be w the same car / computer / phone / suit / etc. And if you’re poor there’s very little incentive or benefit to follow your implied advice… the savings will be meager if any WHILE the experience will be fairly subpar on a substandard phone that to boot in a couple of months will be running sluggish / out of storage space. JUMP has been such a hit because it actually helps. It’s been an exception, an example to how the masses are not wrong all of the time… and conversely, often-repeated advice is not always ideal. If you can afford to plop $800 cash for a phone, great. So could I, but I’d rather use that for something else, and just pay $20 a month (I wait for price drops) which I also can do easily. There is no wrong way to this. they lost me at the word “McAfee”. That company’s products are crap. What happens when you lose the phone or get it stolen ? Apple Care Plus does not cover theft or lost phone. So you will still continue to play the monthly fee (if you did not pay for the phone outright) and on top of that you will need to get another phone and pay full price or pay monthly again. Correct. .so you in essence will be paying double. Getting insurance is NO Brainer folks. I stopped paying for cell phone insurance through TMobile after I submitted a claim when I lost my Samsung Galaxy Nexus phone about 5 years ago. I was going to pay the deductible. But here’s the kicker, they wanted to give me a two year old phone in new condition with obviously outdated and inferior tech specs than my Nexus at the time. I almost cancelled my TMobile account until TMobile agreed to give me the Nexus they were selling at that time after I paid my $150 deductible. that’s like having insurance on a galaxy Note 1 and then you make a claim and they give u a Note 3. What’s your complaint? Ur phone was 5 years old and obviously not carried by Ausurion any longer. Perhaps I wasn’t clear. Asurion wanted to replace my Nexus with a non-nexus device that was older than my Nexus. It’s like owning a Mercedes and insurance offering a Kia, even if it’s new it’ll never compare. It was TMobile who went ahead and offered me the newer Nexus not Asurion and for that reason I cancelled my insurance. If Asurion is going to be in the business of insuring phones then they better damn well be ready to replace the exact phone or it’s successor. You didn’t have to accept the phone being offered. Just ask to speak to a manager or hang up and call back. Also if your phone is older then 2-3 years I would cancel the insurance. With the monthly cost of insurance and the deductible you can just buy your own replacement. I’m on Orginal Jump1 4 years of service & I’ve never used once. That’s why I got jump on demand. No taxes for the whole phone up front, and you can upgrade 3x a year if you want and you have the option to remove insurance. Jump 1&2 both require insurance. The smart move is to wait until these new phones drop to the $300 to $400 range before buying them. Keep your $15 month. After saving your $15 a month for 2 years, you have enough saved up to replace your phone out right. Hhhmmmm… If only it were so easy. By the time a flagship goes down to $3-400, new models are so much better I no longer want the discountee / or only @ $150-200 as backup / holdover. If you want the latest, sure. I bought on payment the G4 about 9 months after it was out. Paid about $400 for it. Then a yr later got the G5 and it too was about that price. Other phones surpassed but, but both were better than what I had each time before so didn’t matter to me that there was something better than those. I didn’t need to spend more because there was something 2 steps better. 1 step better was fine for me. I want an S8, but might wait a bit. Besides 6+” I want the international version’s 6/128gb…not the puny 4/32 on this side of the pond. I also want LG’s removable battery and IR. But even that inferior animal does not exist. It’s not about having the latest and greatest, it’s that most Android models offered quickly get filled up n feel small… nothing meant to last any significant time. I can’t read like that. Or buy a one plus device for 400, that are on par specswise with the premium phones. How does it work if you buy the S8 with PDP plus then the next day you lose your phone or it breaks? Do you just pay the $175 deductible and they send you a new phone? You know that you have free virus protection with your laptop? It is windows defender,the same protection MS uses on their computers. Don’t forgot Lookout,on your phone,I am sure Apple has it own protection too. Cool.well have no way to know if Apple does or doesn’t,never had iphone,Imac,mac computer,so I couldn’t tell you,if you are worry about gov,spyware,get off the grid,don’t have bank account,etc. Not trying to be funny or anything,but if you have a ssn,you can’t really do anything about it. I find out about Window Defender from my computer repair guy,you might want to ask yours. When I brought in computer to get repair he told about me WD. I completely agree. 175 is way too Mich if you’ve been paying insurance for years without a claim. Should be one free claim if you’ve paid for insurance over 2 years without claim or like you said a reduction in monthly cost. I want protection but don’t want to pay that 15 a month plus 175 if I actually need to use it. TMobile… the only place where you can go in to upgrade with JoD a bootlooped G4 with a G6 and come out with the new Premium Device Protection Plus which at no point was it offered, no point mentioned, yet slapped on anyways. Then Customer Care says when you upgrade, theya re automatically added. Um no… hasn’t EVER been added on any phone line I’ve used JoD before. Shady Shady Shady!! Sooo, swapping Lookout for Mcaffee for $3 more a month. T-mobile we just want cheaper premiums. yeah this mcafee security for t-mobile is a rip-off and doesn’t include password manager as described in the tmobile press release. I tried using the same login info I setup on my phone thru mcafee website on my computer and the subscription doesn’t give a download link to install the password manager on my pc going to call tmobile care rep tomorrow and get verification on the password manager if not going back to the $12 premium device protection. I really like ewallet by illium software. It’s $10 but converts so much more than passwords. It has military grade security.